When K.C. first came to our office, he was unhappy with the bonding on his 2 front teeth, as he’d had it done multiple times, but it kept chipping and staining. Overall, he was pretty happy with his smile – didn’t want to make any big changes, was happy with how bright the teeth were, etc. But he wanted a better solution for the 2 front teeth. 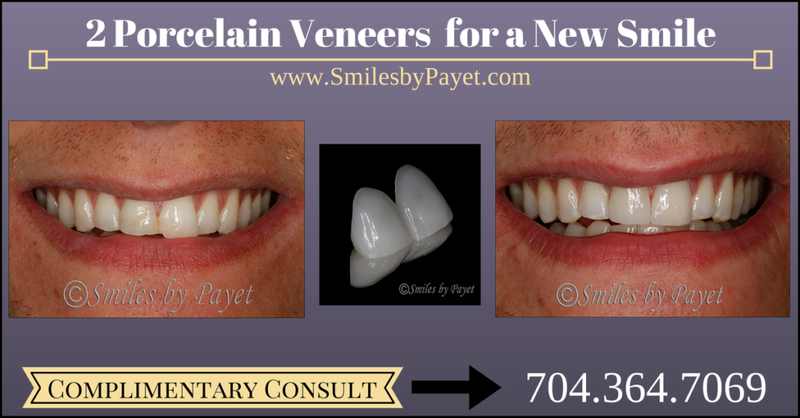 While bonding is a great solution to fixed chipped and worn teeth, for patients with the highest esthetic demands AND who want the work to last as long as possible, I’m still a believer that porcelain veneers or crowns are the right solution. Of course, for patients who keep chipping their teeth, we highly recommend a NTI nightguard to protect against teeth grinding at night. Since K.C. didn’t have concerns about any other teeth, the right choice was just 2 porcelain veneers, and in about 3 weeks, he went from having stained, uneven, and chipped teeth to a smile he loves again. How Many Porcelain Veneers Do You Need?